Online Video Poker is one of the most popular forms of online gambling. For the player who likes a game of skill, a low house edge, the possibility of large wins, and the anonymity of playing alone, there is nothing that compares to online Video Poker. The rules of online Video Poker are simple. You play 1 to 5 coins, the machine gives you five cards, you choose which to hold and which to discard, the machine replaces your discarded cards and pays you off according to the value of your hand. We wrote earlier that the house always has the advantage, but online Video Poker is actually an exception to that general rule. If you look for the most liberal pay tables, and play them properly, you can have a small advantage. Some pay tables, which are slightly in the machine’s favor, can return over 100% if you take incentives such as cashback, free play and mailers into account. The most important tip for a Video Poker player is to always play maximum coins. You’ll see that when you look at the paytable for each Video Poker game, you can play between 1 and 5 coins per hand (generally). If you look at the payouts for wins playing on 5 coins, almost invariably one or two of these pay out a higher relative return than when you play 4 coins or less. 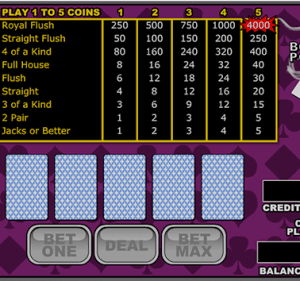 For example, a Royal Flush played at 5 coins (“max”) will usually pay 4,000 coins as opposed to 800 at 1 coin, 1600 at 2 coins, 2400 at 3 coins or 3200 at 4 coins. You can see the jump between 4 and 5 coins is proportionately bigger than the jumps below. The “expected return” for each game is calculated based on a player playing 5 coins. So if that is advertised as 99.58%, were you to play at 4 coins, this would be reduced significantly, perhaps paying closer to 98% (or a “house edge” of 2%). On the subject of expected returns, you should also bear in mind that this is based on a player playing to the correct strategy for the Video Poker game, and of course, every variant of Video Poker requires a different strategy. For example, in Jacks Or Better, if you are dealt with three 2’s and two Aces, you’d hold the lot. However, the payout for 4 2’s (2’s are referred to as “deuces”) in Deuces Wild is a significant one, so in Deuces Wild, you’d drop the two aces and go for the 4th deuce. Even a slight deviation from the normal strategy will reduce the expected return significantly. Therefore, if you do not know the strategy, you are probably best of playing at a Microgaming software-based online casino which has an “expert mode” and does the strategy for you, rather than a Cryptologic software-based casino that doesn’t. Another thing to be aware of, is the difference in payouts between the software providers. Cryptologic casinos have different pay tables for each Video Poker game and Microgaming, RTG and Playtech also all have their own paytables. RTG based casinos are also able to set their own paytables for Video Poker games, where the other casino software providers do not allow that. This could possibly be a plus, but in many instances is not something players are particularly keen on. It means you have to work out manually what the odds are, whereas with the other providers, you can find charts for each of the other softwares knowing that all online casinos on this software will have the same payouts for each type of Video Poker.